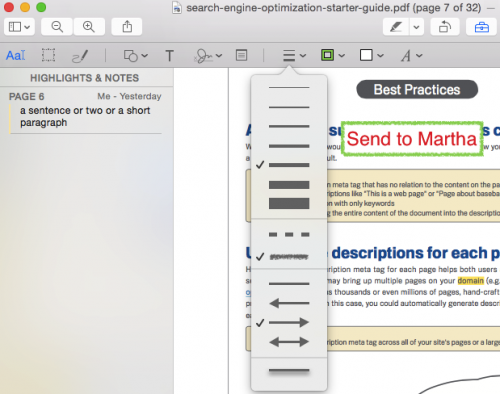 1.Open the PDF file in Preview, and then open up the Markup Toolbar by clicking the toolbox icon from the main toolbar. 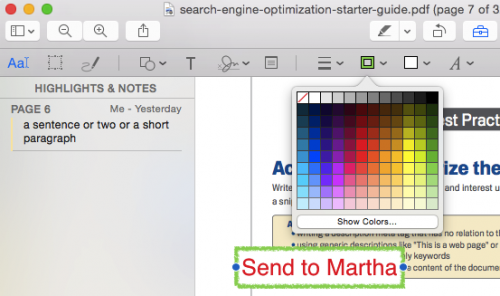 2.To add a shape, click on the shapes icon in the markup toolbar. The main shapes are a line, arrow, rectangle, round-cornered rectangle, circle, speech bubble, star, and polygon. The two advanced shapes are the Mask and Loupe shapes, which are used to focus in on an area. The Mask will create a rectangular area. Everything outside the area will be darkened but still legible. The Loupe will create a circle that magnifies everything inside of it. 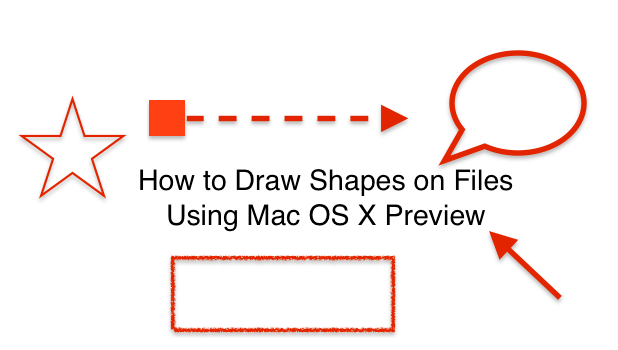 3.The shape you select will appear in the center of your PDF. To move the shape, click on it once to select it. Hover your cursor over the edge of the shape; it should change to a grabbing hand. Click and drag your shape. 4.To resize a shape, select it, and then click and drag one of the blue handles. The polygon and star shapes have green handles that allow you to change the number of points. The arrow and line have a green handle that allows you to bend the middle point. 5.You can change the thickness, style, and add shadow to your border by clicking the shape style button to the left of the border color tool. 6.To change the color of your shape’s outline, click the icon with the hollow square and choose a color. The white square with a red slash through it denotes a clear. 7.To change the fill color, select the shape, and then click Fill Color from the markup toolbar as shown below. The white square with a red slash through it denotes a clear background.